Grilled flank steak with Garlic-Ginger Marinade | Relish! Honey adds a sweetness to this savory grilled steak suffused with ginger, lime, and garlic. In a large resealable plastic bag, combine all ingredients except steak and mix thoroughly. Add steak and turn to coat. Close bag and allow to marinate in the refrigerator for 1 hour or up to all day. 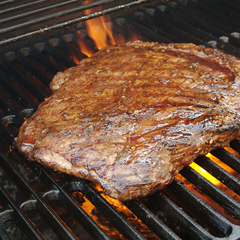 Once steak has marinated, remove from refrigerator and bring to room temperature for at least 15 minutes. Heat a lightly oiled grill pan to medium-high heat or heat grill to medium-high heat. When pan is heated, remove steak from marinade, shake off excess, add to pan (or grill) and cook for about 6 to 8 minutes per side for medium rare.